Looking for artwork specs? Need some help with our customization tool? This is the spot for you! 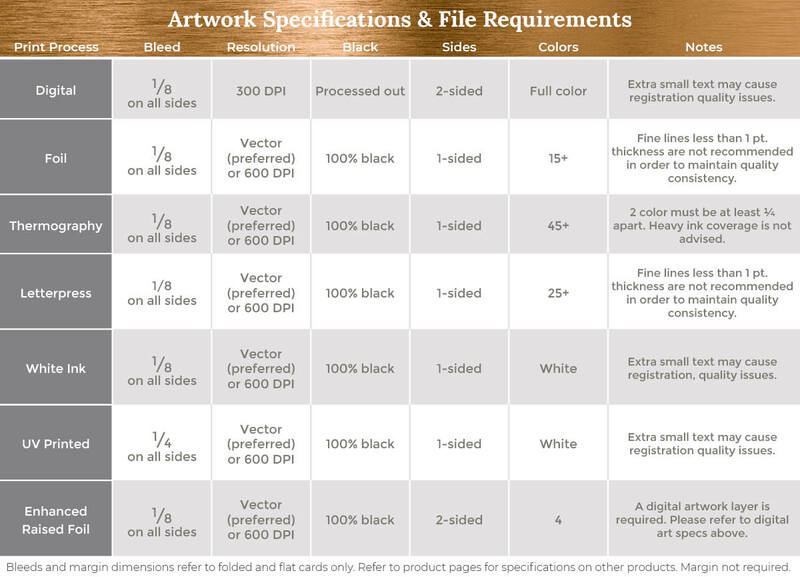 The details listed here will help get your amazing artwork on paper using our custom print site. If you have a question that isn't answered here, check out FAQs or contact our Customer Care Team. We require at least 1/4" of space between two ink colors and/or print processes. Tighter registration is possible with a special quote and longer production time. Please contact our Customer Care Team. Refer to our Product Templates to understand where the score, trim and perforation lines fall for each product. Our customization tool can only accept files that are the correct dimensions. Please refer to the product details page to see the exact artwork size for each product and each print process. Choose the "high quality" option. Name your file with letters and numbers only (no special characters). Uncheck "preserve editing capabilities" (if using Adobe Photoshop or Illustrator). Hide all non-art and template layers. We accept print-ready PDFs only.